This year I wanted to create some little ornaments with my own artwork. I had some art boards and thought they would be perfect. Join me for a little tutorial so you can make your own. If you would like one of mine, I have a few in my Etsy Shop HERE! •Color photocopies of artwork or other images (I printed mine with a laser printer onto Premium Laser Paper by HP and sized the images at about 4.5" x 4.5" so they would be a little larger than the panel). •4" x 4" art boards (I used Ampersand brand with a 3/8" profile). 1. Brush adhesive onto art board with brush or fingers. 2. 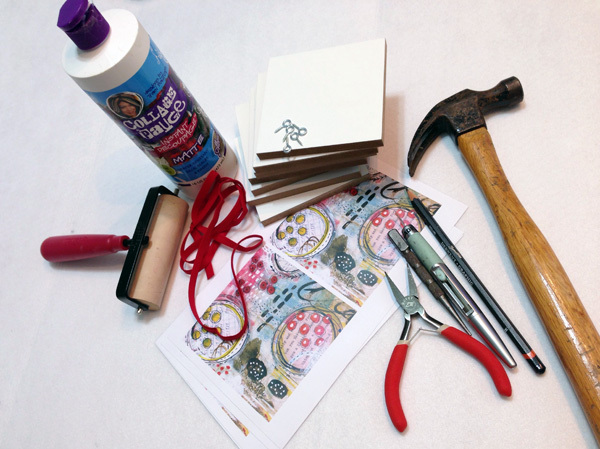 Place color image onto board and smooth out air bubbles by running a brayer gently across the board. Set aside to dry. 3. Using a sharp blade, turn the board over and trim off the extra paper. 4. 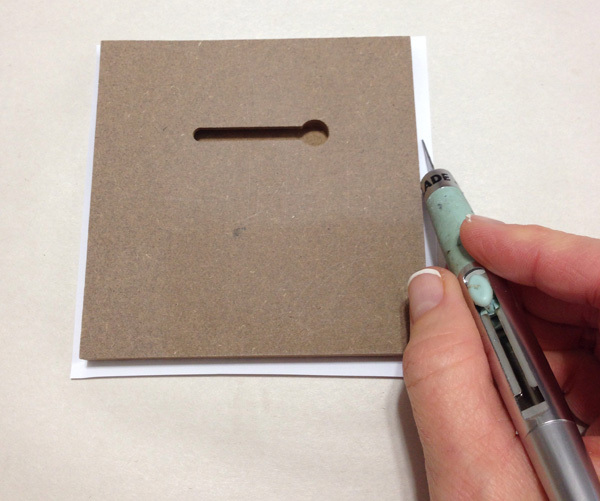 Using a pencil, mark a small spot at 2" and gently tap the center punch to create a little hole. Be careful when tapping so you don't crack the board. 5. Place the screw eye into the hole and gently turn it until it is flush with the wood. If you have trouble turning the screw eye, use a small pair of pliers to help turn it. 6. Insert a matching ribbon and tie into a loop.